The world of embroidery is ever-changing and is also a very customizable process. Because embroidery has become so popular, many manufacturers and smaller providers can offer custom work that’s tailored just to their needs. By using various stitching techniques, designs and colors, the options for how your final product will look are pretty endless. Plus, most embroidering companies can handle large quantity orders because of the revolution of digitized machines. 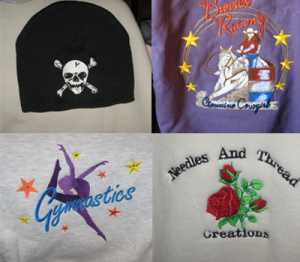 There are many different types of custom embroidery and below are just 5 of them. Hats: whether for personal or business use, custom embroidering hats is a unique service. With the right thread and color, you can have your favorite team name, company logo or charity event embroidered on the front, back and underside of a hat. Children’s clothing: any time a piece of child’s clothing whether shirt, skirt or sweater is customized at all, it adds a personal touch. With many selections of font, design and color, you can turn a plain piece into a beautiful and colorful addition to a child’s wardrobe. Sweatshirts: the heavier material used to make sweatshirts can still be custom embroidered for work related purposes or for personal use. Custom embroidered sweatshirts are great Christmas presents too. T-Shirts: this option is great for company use. When you want every employee to have the same professional attire, custom embroidered shirts are the way to go. Tote bags: these can make a wonderful promotional item when attending trade show events. Most embroidering machines nowadays can embroider on every type of fabric, which makes customizing easier. We do offer custom embroidery services for the above products. Be sure to visit our website for additional information or as always, you can contact about our services. This entry was posted in Embroidery and tagged bags, business, clothing, color, company, Custom, design, Embroidery, event, hats, logo, shirts, sweatshirts, types. Bookmark the permalink. Follow any comments here with the RSS feed for this post. Post a comment or leave a trackback: Trackback URL.